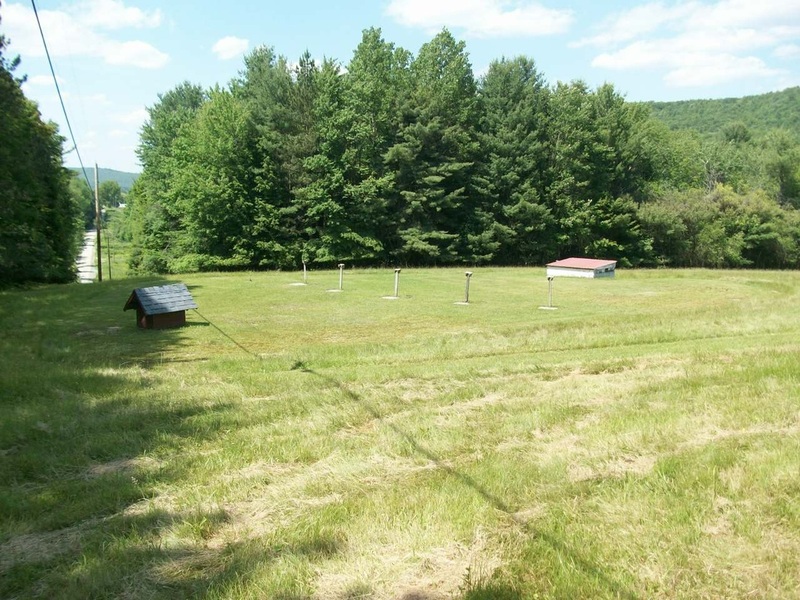 New Milford Rifle and Pistol Club is a membership supported, private shooting facility nestled in the Endless Mountains Region of North East Pennsylvania. 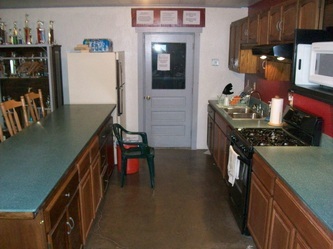 There is a set cap of membership that we allow but currently we have several openings for new members. Please see our Membership Page for more information on joining our family of shooters. The Club itself features a full range of shooting opportunities available to our members and their guests. Regular members enjoy 24/7 access to all the facilities and ranges. We are a 100% NRA Membership Club and received the NRA Gold Medal Club status in 2015 and 2016. We now belong to an elite group of less than 100 clubs nationwide that qualify for this distinction. Why not join the NRA today and protect our shooting rights? The NRA is the foremost advocate of gun clubs and Second Amendment Rights in the USA at this time. More and more gun clubs, such as ours, are going out of existence and it is virtually impossible to open a new one anymore. 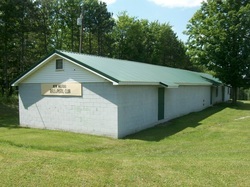 New Milford Rifle & Pistol Club is proud to be a 100% NRA Member Club as well as an NRA Recruiting Organization. 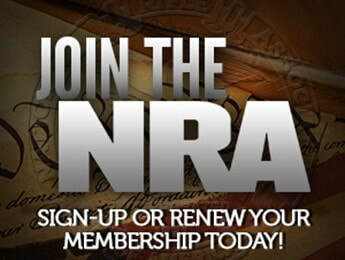 Just click on the "Join the NRA Here" emblem below and join up now! Attached to the Club House is a 50' Heated Indoor Range. 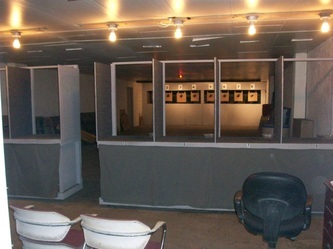 The range features 8 stations and allows for Center-fire and .22 Pistol as well as .22 Rifle shooting. The Club hosts both a Sporterifle Winter League and a Pistol Winter League. Please see our Rifle and Pistol pages for more information on these activities as well as information on how to join the league. Membership in the Club is NOT necessary to be a part of these activities. Currently the indoor range is limited to all .22 rimfire use and lead only center-fire up to 45ACP. 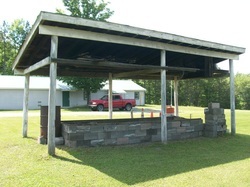 The 100 Meter Outdoor Range features covered shooting positions with 2 permanent benches cut for both Right-Handed and Left-Handed bench rest and sighting activities. There is a gun rack provided for your convenience as well as yardage markers in 10 Yard increments the entire length of the range. This range started out at 100 Yards but as Silhouette Target shooting became more popular the range was extended to allow for the full distance required of 100 Meters. 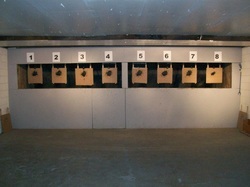 The Club has a full set of Silhouette Targets for members to setup and use at any time. We strongly encourage our members to police their shooting area and dispose of any trash or brass when they are done with the range and there is a garbage can provided for that purpose. 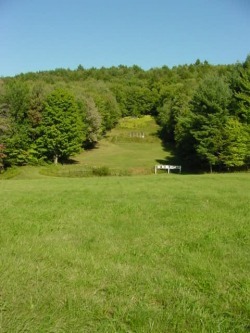 The New Milford Rifle and Pistol Club features 2 trap fields. The lower trap was just replaced in 2011 with a Super Star Doubles Trap. 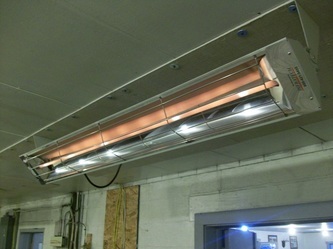 This trap is fully automatic with a 4 case bird capacity and voice releases by BRB Systems USA. The upper trap is a Beomat fully automatic trap with 3 case bird capacity, wobble function and voice releases by Canterbury Voice Release. Both traps were serviced in early 2013 and calibrated for many years of trouble-free service. 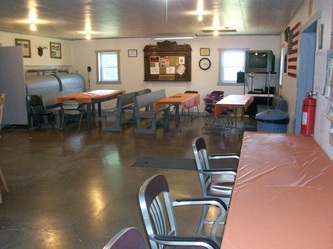 Featuring the counties only 300 yard range makes New Milford Rifle and Pistol a unique facility. Target banks are located at 100, 200 and 300 yard distances. The 200 yard frames are in place from the hey-day of military marksmanship where folks hailed from near and far to complete their NRA certification. 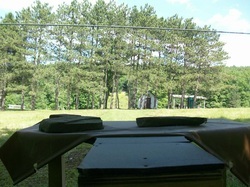 There is a storage building located to the left of the 200 yard frames that houses the target backers for this purpose. 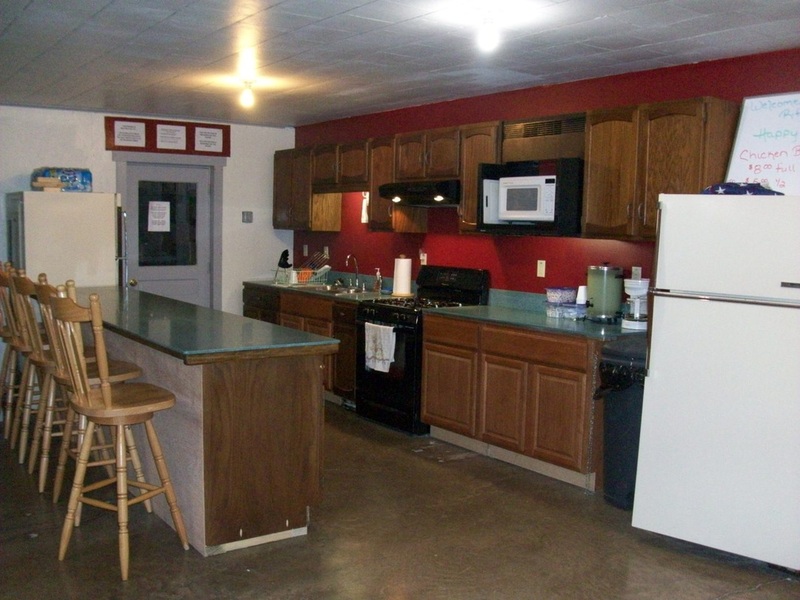 This range is also the home of our famous "Running Deer" target presentation. Traveling along a cable from left to right, a target is released with a deer silhouette marked with the various vital areas rated for scoring. 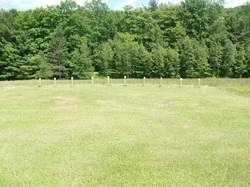 Posts marking the shooting area for the running deer are located just before the 100 yard stands. 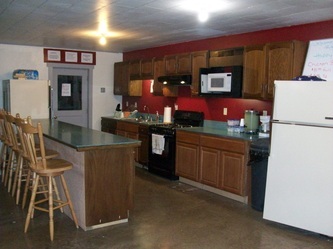 The equipment and rail frames for this are in the 200 yard storage building. Our newest addition to the shooting facilities here at NMRPC is the 480 yard range. Get your high power tack driver out and zero in at long range. 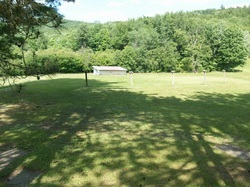 An access road is available to target stands, feel free to bring your 4-wheeler or side-by-side. Use of this range is available to the public by appointment, please contact us if interested. 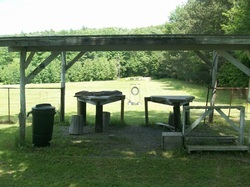 A favorite event at most of our shotgun competitions, the Lucky X range is just left of the BBQ pit. 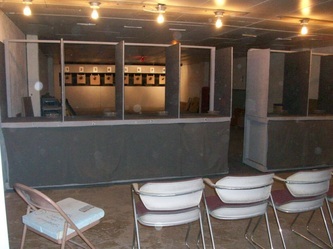 This area features 12 target stations presented at 25 yards from the shooting positions. A small target is posted that has an X in the center, the shooters then proceed to take aim and fire. The shooter with the closest pellet to the center is the winner. The club provides the shell and no "goose guns" are allowed. This is where the magic happens on our World Famous Father's Day Chicken BBQ. 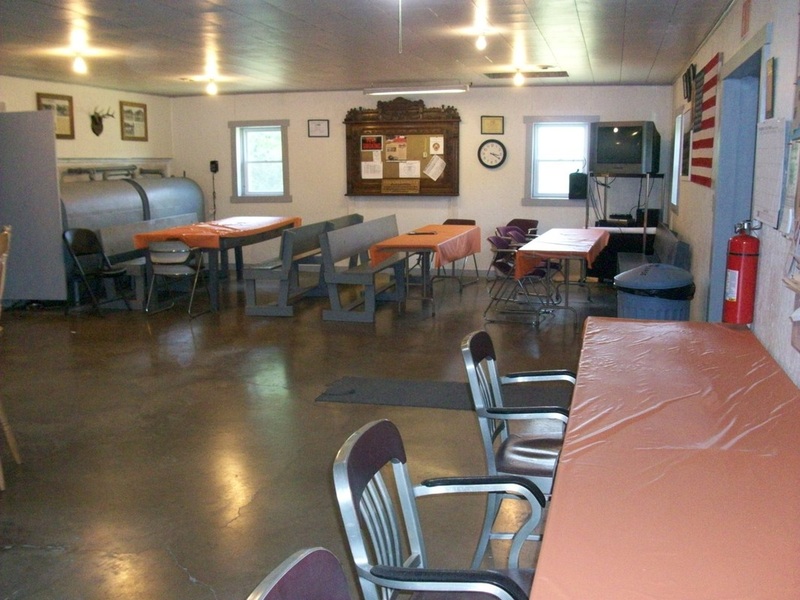 A tradition going back more years than most of us can remember, New Milford Rifle and Pistol hosts a BBQ each and every Father's Day along with the last shoot of the Susquehanna County Trap League.